Newcomer Magazine - The Magazine for Relocation, Lifestyle, and Living in Atlanta. It all comes together at Arlington Christian School: Christian educators working with families to provide an unparalleled comprehensive Christian education for students. The Christian worldview permeates every endeavor as the school continually strives to uphold its core values: Knowledge, Honor, Truth, Wisdom, Excellence, and Integrity. “Leadership” is what characterizes the Arlington experience in college prep academics, quality fine arts, and multiple athletic offerings. Students are provided the opportunity to develop their God-given talents in a nurturing, safe and student-centered environment. Extracurricular activity opportunities abound. ACS students earn solid academic credentials, wonderful school experiences, life-long friends and a background of approaching life from a Christian perspective. For information, contact the school directly at 770-964-9871 or visit arlingtonchristian.org. 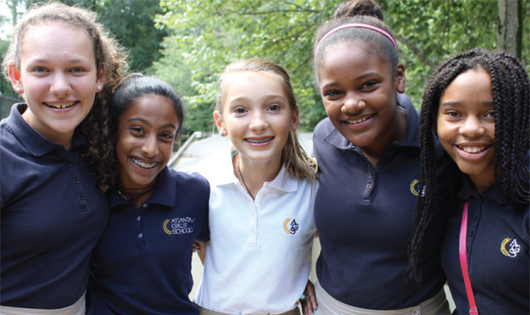 Atlanta Girls’ School offers girls in grades 6 through 12 a college-preparatory curriculum of the highest standards. Graduates attend Ivy League schools, prestigious liberal arts colleges, leading Southeastern universities and respected research institutes. Atlanta Girls’ School was custom-built for one purpose: girls’ achievement and success. Girls attending AGS learn to take appropriate risks, be courageous leaders, give back to their communities and project personal confidence and competence in all they do. Attend the school’s open house on November 12 and see what makes it truly unique. For more information, call Atlanta Girls’ school at 404-845-0900 or visit atlantagirlsschool.org. Now in its 19th year, Bridgeway Christian Academy is a covenant Christian school located in Alpharetta, GA. At BCA, students experience a family-like atmosphere where they are nurtured and challenged; in fact, its parents consistently say it was the family atmosphere that brought them to Bridgeway. At BCA, the primary goal is to create environments where students can grow in wisdom, stature, and in favor with God and man. Dedicated Christian teachers and comprehensive biblical integration, in a safe and nurturing environment, are at the core of its programs. The decision of where and how to educate your child is one of the most important decisions you have to make. If you are considering an academically Christ-centered school, then consider Bridgeway Christian Academy. You’re invited to visit the campus and see how the school fulfills its mission of providing excellence in Christ-centered education, equipping students to know, grow, and go. For more information, call 770-751-1972 or visit bridgewayca.org. The Bedford School offers a fresh start to students who have been frustrated in a traditional setting due to learning differences. The school serves children in grades 1-9 who have been professionally identified as having specific learning disabilities and related disorders. The mission of The Bedford School is to maximize the potential of children with learning differences and develop foundations for success; this is accomplished through small classes (5-12 per class), a structured, multisensory approach and a dedicated staff. The school was established in 1985 and currently serves 150 students. The Squirrel Hollow Camp summer program offers academic tutoring in a recreational environment and is open to children who need an academic boost in the summer; a student does not have to be enrolled in the school to attend summer camp. Students receive tutoring in reading, math and written expression and participate in recreational activities on their challenge course and their outdoor pool. Bedford is located on a 45-acre campus in Fairburn, 15 minutes south of Hartsfield-Jackson Atlanta International Airport. For more information, contact Dr. Betsy Box, Director, at 770-774-8001 or go online to thebedfordschool.org. Brandon Hall’s mission as a co-educational, global boarding and day school challenges students to lead lives of leadership, scholarship and service. Its community celebrates learning, fosters global citizenship, embraces diversity, encourages athleticism and artistic expression, and inspires students to find their path and lead the way. Brandon Hall welcomes boarding students, day students and international students from all over the world. Although its primary focus is cultivating academic scholars, it also emphasizes character development, service and leadership preparation, ensuring that these qualities are woven into the fabric of its community. Its 100 percent college acceptance rate reflects the quality of its program and the strengths of a diverse student body. Its graduates are poised to be leaders in the next phase of their academic life and beyond. Brandon Hall focuses on science, technology, engineering, arts and math education that will prepare students for the rapid pace of innovation in the world. It provides students with the confidence to thrive in this global world, while caring for the environment, health and wellbeing and service. Brandon Hall believes that building a strong educational foundation inspires students to be engaged citizens and proactive leaders in an ever-changing world. For more information, call 770-394-8177 or visit brandonhall.org. Canterbury School is an independent, non-profit private school located in the Morningside-Emory area of Atlanta, offering a range of programs for infants through eighth grade. It provides an innovative alternative learning environment that embraces diversity of all kinds, where students’ ideas are valued, their individuality is celebrated, and they are empowered to steer their own education. Since 1954, Canterbury School has been dedicated to providing a superior, nurturing education for young children, and it challenges each child to meet his or her potential by providing small class sizes, an adaptable environment and a flexible curriculum. For more information, call the school at 404-522-5659 or visit canterburyschoolga.com. The Friends School of Atlanta (FSA) provides challenging academics in a diverse environment, drawing on values of simplicity, peace, integrity, community, equality and stewardship to empower students to go out into the world with conscience, conviction and compassion. Founded as a model of diversity in 1991, FSA strives to address the development of the whole child and seeks to nurture that of goodness within each student. Offering classes for children from three years old through eighth grade, FSA’s program is designed to prepare students for a successful high school future and a lifetime of engagement as thoughtful citizens. For more information, call 404-373-8746 or visit friendsschoolatlanta.org. There is no place like High Meadows School. Since 1973, High Meadows students in Pre-K through 8th grade have learned through experiential, immersive educational opportunities, offered both in the school’s spacious, light-filled classrooms and across 42 acres of grassy fields and scenic woodlands. High Meadows School’s progressive curriculum focuses on developing future global citizens and innovative leaders who embrace challenge and think for themselves. High Meadows lower-year classrooms offer low student-teacher ratios in which instruction emphasizes academic excellence, love of learning, critical thinking and environmental and social responsibility. As a nationally recognized and award-winning leader in progressive education, High Meadows is an accredited International Baccalaureate (IB) World School, offering its renowned Primary Years Programme for students in preschool through fifth grade. High Meadows teachers are unequaled in their intellect, passion, and compassion for their students. Through interactive, inquiry-based instruction, supported by of-the-moment technology and our nature-based campus, every day they inspire authentic learning opportunities that are engaging and—literally and figuratively—sticky. When children graduate from High Meadows, they are empowered with a deep respect for international perspectives, an intuitive understanding of life’s interconnectedness, and an exceedingly strong sense of self. Education is an expedition that starts from the moment we are born. When we teach children to be curious and inquiring at an early age, we create within them a love of learning that lasts a lifetime. What is more important than that? Come see how all this comes to life with a tour of our campus. We invite you to talk with us about how your child may find his or her sense of place with us, and speak with current and alumni parents to learn about their own experiences firsthand. For more information, call 770-993-2940 or visit highmeadows.org. Johns Creek Montessori School of Georgia offers authentic Montessori education in the heart of Johns Creek, serving children from 6 weeks to 8 years old. Observe the “Montessori Magic” happening in the school’s vibrant classroom communities, where children are free to choose from a wide variety of activities and lessons best suited to their development. Specially-trained teachers act as “guides” to the extensive curriculum, planting a seed of wonder that grows into a desire for greater knowledge. Multi-age classrooms allow younger children to learn from older ones, and for older children to reinforce and “test” their learning when helping younger ones. This dynamic, structured environment nurtures a strong work ethic, love of learning, and a passion for discovery not found in other schools. Dr. Maria Montessori wrote, “Education should no longer be mostly imparting of knowledge, but must take a new path, seeking the release of human potentialities.” Help your child to reach his or her full potential. Call 770-814-8001 to schedule a tour or visit JCMSOG.org. Johnson Ferry Christian Academy is a certified University Model® School that prepares students for life academically, spiritually, and relationally in a vibrant community atmosphere. It delivers a personalized, accredited, college-preparatory education with a uniquely flexible schedule. The staff leads with a love for Christ, a desire for all students to discover God’s purpose in their lives, and a passion to prepare students for life. Established in 2004, JFCA is a ministry of Johnson Ferry Baptist Church and provides an educational program for grades K-12. JFCA offers rigorous academics, low teacher-student ratio, opportunities for spiritual growth and personal development in a vibrant school culture, with an array of activities including academic competition, athletics, and fine arts. Mid-semester applications will be accepted beginning October 1. JFCA is accredited through AdvancEd, the Association of Christian Schools International, and the Georgia Accrediting Commission. For more information, call 678-784-5231 or visit jfca.org. Holy Spirit Preparatory School is a remarkable choice among Atlanta’s independent schools. The young but accomplished school is one of the few independent Catholic schools in the Atlanta metro area. It serves students from 6 months all the way through 12th grade, so is perfect for families. Its high school keeps getting named one of the top Catholic high schools in the country by the Catholic Education Honor Roll. Really, it’s all about fit. Because they maintain a smaller enrollment than most independent schools, HSP finds the right place for each student—channeling them to the right club, the right gifted classes, the right team—and the right college fit after HSP. This school is all about personalized learning, small class sizes, and forming students in “mind, body, and soul” in a family of faith and learning. For more information, call 678-761-7992 or visit holyspiritprep.org. Lanier Christian Academy is a preparatory school for grades K-12. LCA features two educational models, the traditional five-day school, and the UM® (University Model) school with three days of class instruction and two days under the supervision of parents in the home. Lanier Christian Academy provides a strong Christian education taught from a Biblical worldview. In partnership with families to develop a well-rounded student, LCA offers discipleship, character development and leadership as a part of the overall LCA program. To prepare Lanier Christian Academy students for life beyond LCA, the school also offers AP and Dual Enrollment classes. LCA is accredited by AdvancED, ACSI, and NAUMS. For information, call 678-828-8350 or visit lanierchristian.org. It’s Midtown International School’s unique combination of gifted and global that sets it apart. At MIS, diverse and inquisitive students yearn to engage in a world bigger and infinitely more complex than themselves. Through global languages and course-embedded travel, MIS quenches their thirst for connecting intellectual, cultural, political, and artistic experiences. And it’s a school for ambitious, accelerated learners; it knows its students thrive in settings where personal interaction drives breakthroughs, where challenge ignites creativity and invention, and where problem-based learning leads to the next exciting discovery. So what happens in a school designed for such curious, globally minded learners? No one waits to learn. Call 404-542-7003 or visit midtowninternationalschool.com for more information. For nearly twenty years, Mt. Bethel Christian Academy has been the school of choice for families from East Cobb and beyond desiring a JK-12th grade, Christ-centered education for their children. College-preparatory in its approach, Mt. Bethel’s curriculum challenges students with rigorous studies that include a dual-track STEM program, honors and AP opportunities. A one-to-one laptop program (5th through 12th) allows students to access their textbooks and reference material online and includes a communication tool connecting students and parents to teachers. With two campuses in east Cobb County, the combined facilities include spacious classrooms, performing arts, visual arts and video production studios, dining halls, learning commons with dedicated student collaboration space, an 1800-square-foot fully equipped fitness center, two indoor gymnasiums, a six-lane, 25 yard year-round swimming pool, an outdoor pavilion covering a regulation-size basketball court, lighted tennis courts, athletic fields, and two recreational lakes. Beyond the classroom, a championship athletic program includes volleyball, soccer, basketball, swimming, cross-country, baseball, golf, tennis, lacrosse, clay targets, archery, cheerleading and an equestrian team. Bus service is available to the Main Campus (Jr. Kindergarten-8), located at 4385 Lower Roswell Road, and the North Campus (9-12), located at 2509 Post Oak Tritt Rd. Call 770-971-0245 or visit their website at mtbethelchristian.org for further information and open house dates. The Piedmont School of Atlanta serves children in kindergarten through high school with challenges in areas of learning, social skills, and social problem-solving. A team of certified masters-level teachers delivers differentiated instruction using a project-based dynamic approach. The curriculum exceeds the Georgia Standards and includes PE, art, foreign language, and Community-Based Instruction. The Piedmont School has been named a Boxlight National Demonstration School and serves as a model site for incorporating technology in the classroom. The school offers after-school programming. For information call The Piedmont School of Atlanta at 404-382-8200 or visit tpsoa.org. When parents first come tour Porter Academy, many of them feel heavy with frustration, anxiety, and sadness because they have fought hard for their children, but with little success to show for their efforts. These same families, within a few months of enrollment, are able to relax and feel hopeful, knowing that their children are finally happy and learning. The school’s founder, Claudia Porter, didn’t teach a curriculum, she taught a child. She knew each child’s passions, strengths, and stumbling blocks. She knew that their past struggles had made them feel less—less capable, less important, and that these feelings had led many of them to resist trying. They had learned to slip through the cracks or to distract from the real problems by acting out behaviorally. Mrs. Porter knew that the first step to getting children to learn was to rebuild their self confidence and self respect. The school has grown, but the child-centered care and teaching persists, enabling each child to find joy and success in learning. For more information, call 770-594-1313 or visit porteracademy.org. For more than 110 years Riverside Military Academy (RMA) has remained one of the nation’s premier military college preparatory academies, and produces young men of purpose, character, and a commitment to those ideals necessary for citizenship and leadership in a free republic. RMA offers a traditional American-style education where personal values, honor and love of country still matter. RMA is not owned or operated by any particular religious denomination, but supports the spiritual and educational goals of all families. The military process at RMA is not an end in itself; it is simply the means to an end, the end being an educated young man who has experienced the challenges of the military model of education and who is completely prepared for the rigors of college—a cadet who is poised, polite, and confident in any social environment. Hence, RMA cadets stand tall, offer a firm handshake, respect authority and display a level of confidence that parents may not have observed previously. The military setting adds structure, responsibility, accountability and yes, consequences when necessary. All contribute to a well-rounded young man. This environment works for those who have historically underachieved, who simply have not been able to manage their time, and who tend to procrastinate in every endeavor. The rigorous days at RMA are filled with academics, military activities, social activities, and athletics. At RMA, we change what cadets think is good enough in terms of effort and achievement. Please visit the beautiful 206-acre campus located in Gainesville on the shores of Lake Lanier and the foothills of the north Georgia Mountains. Call 1-877-MY-CADET or email apply@riversidemilitary.com. Visit cadet.com for more information. Celebrating more than 60 years of Catholic education as a K-8 school within the Archdiocese of Atlanta, St. Joseph Catholic School is a 2003 and 2016 National Blue Ribbon School of Excellence—a two-time recipient of this prestigious award. Accredited by AdvancED, St. Joseph embraces the Catholic faith while offering an academically challenging curriculum that is enhanced with weekly school mass, art, music, computer lab and Spanish. Extracurricular opportunities include drama, LEGO robotics, basketball, volleyball and more. Before- and after-school care is available. The school is located at 81 Lacy Street in Marietta, Ga. 30060. Call 770-428-3328 or visit stjosephschool.org for more information about this remarkable school. Saint Francis Schools is an independent, not for profit school with no religious affiliation, providing an exceptional college preparatory program serving the students of metro Atlanta since 1976. Grades 1-8 are located on the Roswell campus while the High School is located on the Milton campus. The school’s commitment to small class sizes, low pupil-to-teacher ratio, and a strong emphasis on structure and organization allow students to enjoy academic success and develop the self-confidence necessary to be successful in college. Curriculum offerings include AP, honors, traditional and support classes. Saint Francis is a Google Apps for Education Classroom, utilizing laptops in grades 4-12. Specialized reading programs offered include Fundations®, Wilson Reading System®, Just Words® and supplemental support from Cars and Stars® Reading Comprehension. A full sports program is offered at the middle school and high school levels (GHSA) and includes football and equestrian. For information: 770-641-8257 Ext. 3 (grades 1-8) and 678-339-9989 Ext. 33 (grades 9-12) and saintfrancisschools.com. Located just two miles from historic Marietta Square, The Walker School is metro Atlanta’s college-preparatory independent school for families seeking an engaging educational experience within an intimately scaled, caring and diverse community where opportunities abound and meaningful relationships inspire transformative learning. Walker teachers cultivate students’ spirit of wanting to know in every setting—the classroom and the hallway, the laboratory and the library, the art studio and the stage, the court and the playing field. Walker students learn to value the experience over the applause, developing along the way the confidence to explore new avenues of thinking, the wisdom to articulate meaningful insights and the fortitude to act with integrity and honor. At the culmination of the journey from Early Learners through grade 12, Walker graduates have evolved from curious young learners into critically thinking, expressive, collaborative and honest young adults thoroughly prepared for the intellectual and relational challenges of college and life. For more information, call the school at 678-581-6891 or visit thewalkerschool.org. Woodward Academy is celebrating its second century of fostering excellence, character and opportunity. With almost 2,700 students, two campuses, and an abundance of opportunities, Woodward offers the resources of a college but with the intimacy of home. The main campus (pre-K–12) is in College Park and the north campus (pre-K–6) is in Johns Creek. The average student to teacher ratio is 9:1, creating a personal learning experience for every child. Teachers, coaches, and counselors provide guidance at every step, helping students reach their fullest potential, mentoring them in life-shaping qualities and preparing them for best-fit colleges. Woodward offers a range of college-preparatory instructional tracks that students can mix and match according to their strengths; academic opportunities include 25 AP courses as well as a Transition Program for students with mild learning challenges in grades 2 through 8. No matter a child’s passion, they will find support at Woodward, with hundreds of courses in traditional and innovative subjects as well as a wide array of clubs, arts opportunities, and athletic options. The Global Connections Program, Independent Research Program in the STEM fields, and an award-winning arts program are just some of the challenging opportunities that await. At Woodward, diversity is more than skin deep; it’s integral to the school’s culture. Students develop a deep respect for difference as they collaborate with peers from a broad array of religious, ethnic, and cultural backgrounds from across the metro area. The Woodward experience prepares young people for today’s evolving world. A typical graduating class goes on to attend more than 100 different colleges and universities, devotes 5,000 hours to community service projects, and earns more than $14 million in scholarship awards. Please call 404-765-4000 (main campus), 404-765-4490 (Johns Creek campus) or visit woodward.edu and discover the Woodward Difference today. For additional information about the schools listed here, including location, class size and open house dates, see our “Beyond the Basics” guide.